A Barrett Smythe and Company knife of immense artistry that Barrett Smythe had in their catalogue for $6500 before they closed their New York store. 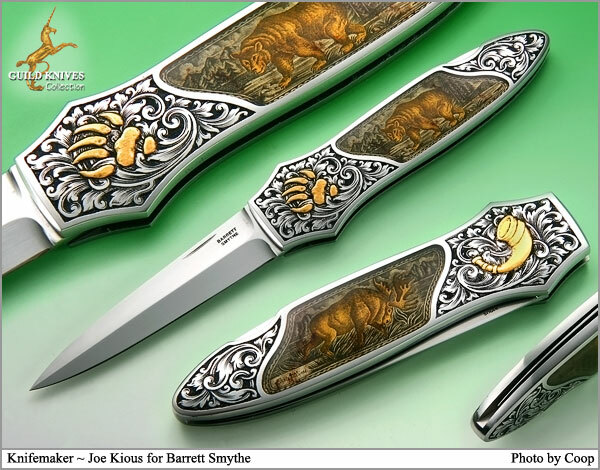 The Gold Bolino engravings of a Bear and Moose are by the famous Italian gun and knife engraver, Giacomo Badillini. The animals are set under clear Quartz Crystal interframes. A hunting horn and bear claw of raised 24K Gold, inlayed onto the engraved front and rear bolsters, are by Jon Robyn. The dagger-shaped double grind blade is engraved: BARRETT SMYTHE. An impressive gentlemanâ€™s carry knife.